Solid-state drives are more expensive but provide a noticeable boost to performance. You are here: Home / Blog / What is the difference between SSD and HDD? Although SSD is relatively new on the market, its growing popularity makes people that want to buy a new computer wonder whether they should buy a computer with SSD or HDD. Whether you are buying a computer for business purposes or for personal needs, you first need to know the difference between SSD and HDD. We will try to explain what these drives are capable of and why SSD is getting so popular very fast. A Hard Disk Drive or HDD, as they are commonly known, is a technology that exists for more than 60 years and it was invented by IBM. This is probably surprising for you but as you can see there are a lot of things that we don’t know about technology until we start reading articles about it. These drives use magnetism in order to store data on a rotating platter. The faster the platter rotates the quicker the data is processed. In the past 20 years there were a lot of improvements regarding processing speed and nowadays computers can perform at 7200 rpm. But the main reason why hard disk drives don’t lose their popularity is their price. They are a lot cheaper compared to the SSD. When it comes to appearance it is hard to tell if you are looking at a HDD or SSD because they appear almost the same. The standard dimensions for hard disk drives are 2,5’’ and 3,5’’ and these dimensions depend on where we use these drives (laptop or desktop computers). SSD stands for Solid State Drive. In the past decade we are witnessing a real boom of USB sticks and if you want to compare SSD with something then try to see it like a huge USB stick. Unlike HDD, SSD uses microchips to store data. This is exactly why SSD is much faster compared to HDD. They don’t need mechanical reading and transferring of data. Solid State Drives use NAND flash technology which is a type of non-erasable memory. This means that the drive keeps the data even when it is completely turned off. Although this technology is relatively new and a lot of people were skeptic about how long can this type of disk drive keep the data now we can see that this is one of the most reliable methods to keep the data. According to some sources, SSD can keep data for over a century, which is impressive. 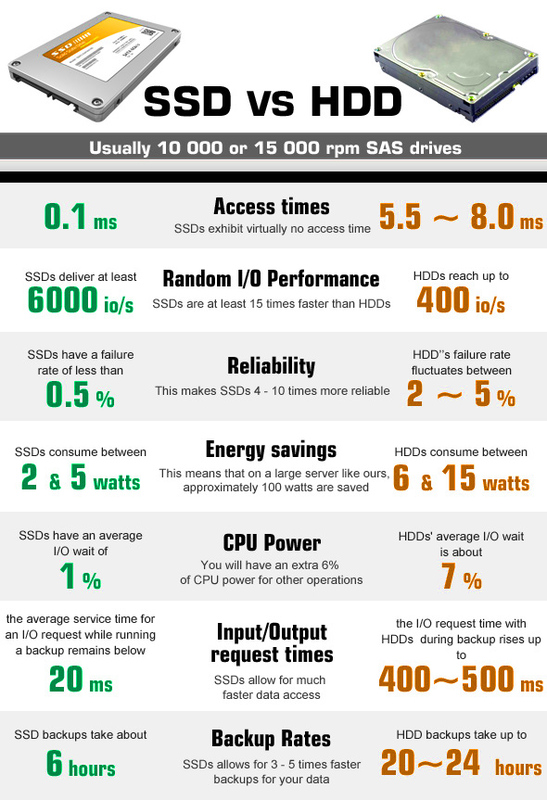 Once again we can compare this technology with HDD – SSD doesn’t need a mechanical processor to read/write data. It can perform these actions thanks to the built-in processor called a controller. The controller is the core of the SSD and its overall performance determines the speed of processing data. For example, ADATA’s SX2000 can write and read data with speed of 1,8 GB/s. When it comes to size, besides the standard HDD sizes SSD also has 1,8’’ version. As you can see there are a lot of differences and similarities between HDD and SSD but the fact remains that SSD is superior in many aspects.